Home › Chrissy Teigen › Chrissy Teigen SLAMS Troll Who Called Her ‘Fat’! Don’t f**k with Chrissy Teigen! 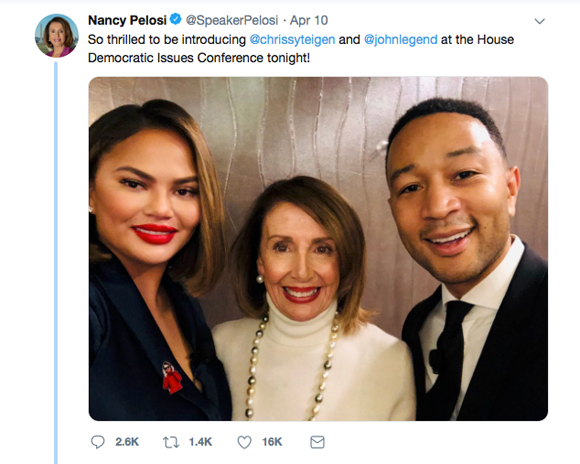 Last week, after introducing them at the House Democratic Issues Conference, Congresswoman Nancy Pelosi shared a pic of the model and her husband, John Legend, on Twitter. Related: Chrissy Teigen Reveals The Sexist Question People Ask John Legend! Unfortunately, one Internet troll had the audacity to make a comment about the Cravings: Recipes for All of the Food You Want to Eat author’s weight. The troll then tried to justify the hate by claiming the 33-year-old criticized Ivanka Trump for posting photos of her children. As we reported earlier this month, Teigen opened up about her weight gain following the birth of her second baby, son Miles, in May 2018. Chrissy, keep living your fabulous life! You’re gorg at any size!